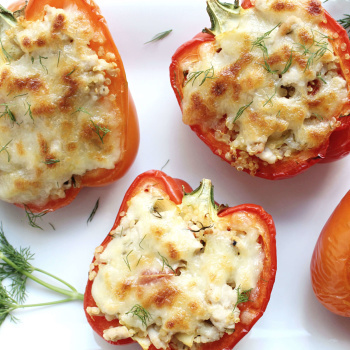 Bell peppers are one of those amazingly versatile vegetables that work in just about anything. But stuffing them is by far my favorite option. 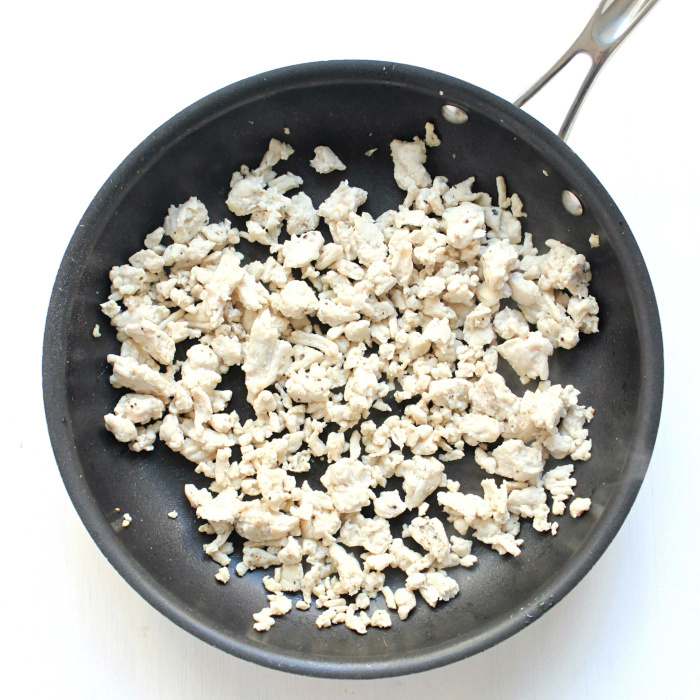 You can use meat or go vegetarian, experiment with seasonings, cheeses, grains, the works! 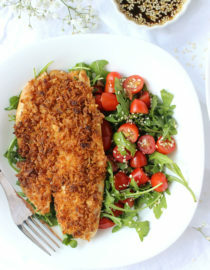 They’re simple and they’re satisfying, making them a practical dinner for two. 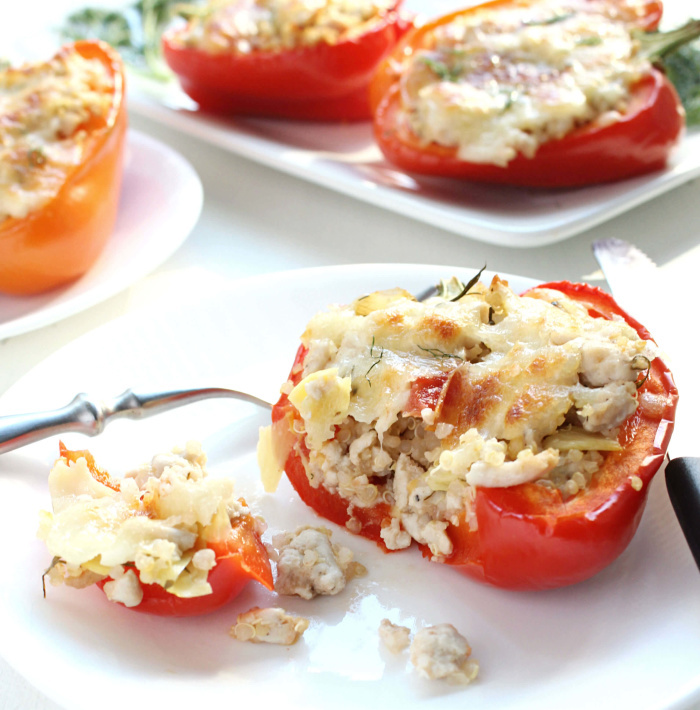 But my favorite way to cook them right now are these Greek style stuffed peppers. They’re fresh, flavorful, and take just 20 minutes to make. Greek food reminds me of summer, so whenever I need a fresh and crisp meal I like to cook something Greek. 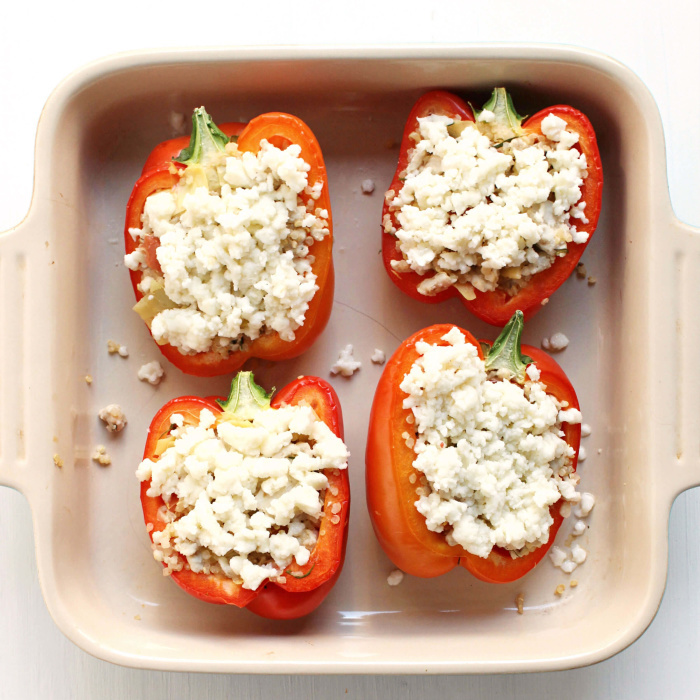 For these peppers I kept things simple, zoning in on classic Greek flavors and ingredients. 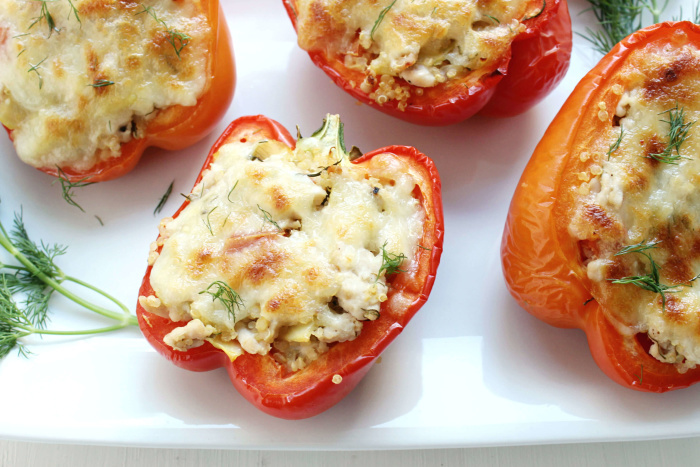 You start by halving the bell peppers and cooking them in a baking dish until just becoming tender, about 20 minutes. 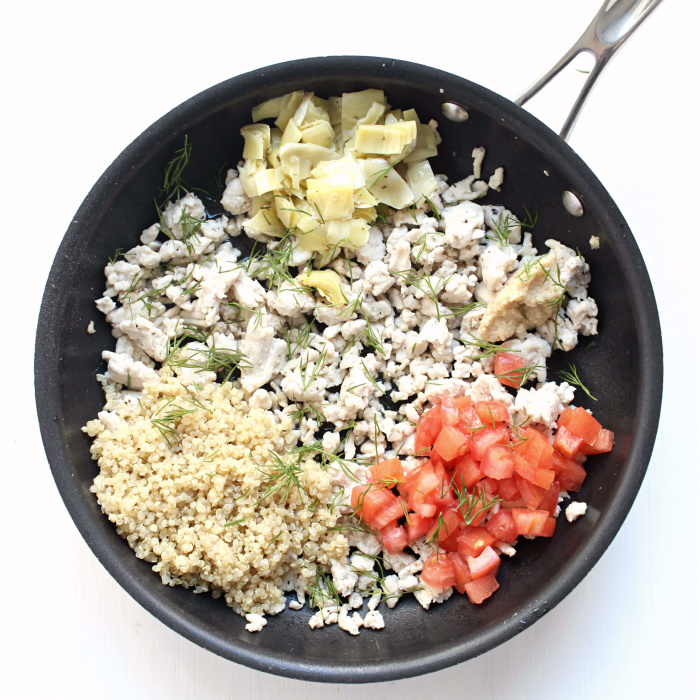 While they cook, in a large skillet brown the ground chicken, then combine with artichokes, tomatoes, quinoa, lemon and garlic. It’s a flavorful, yet clean combination. When you’re ready, add some water to the baking dish with the peppers, then stuff each halve with filling. 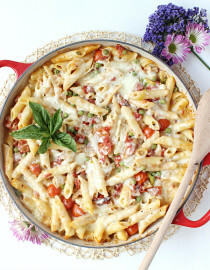 Top with cheese — feta, mozzarella, etc. — then bake until hot and melty. I opted not to stir the mozzarella into my filling because I’m always trying to cut down on cheese, even though I’m literally nibbling on a block of cheddar as I type this. Like the rest of the recipe this portion is flexible too, so feel free to stir cheese into the filling once everything’s cooked, or play around with other varieties like feta or fontina. Also? When I photographed this I stupidly bought a ball of fresh mozzarella, then grated it, which was a particularly messy decision/disaster. So avoid my mistakes, and just buy the stuff shredded! Part-skim, of course — your bikini will thank you. On large cutting board slice bell peppers vertically, then gut of seeds. 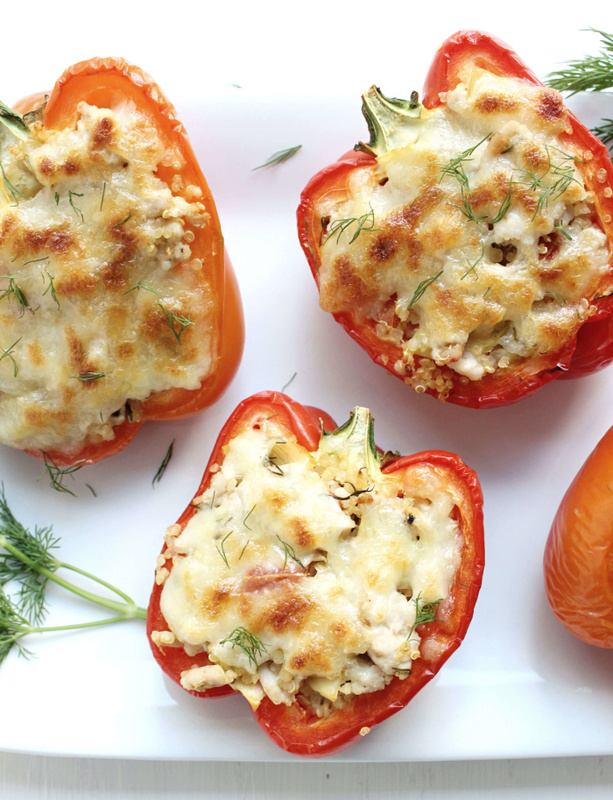 Transfer sliced peppers to oven-safe baking dish and cook for 20 minutes until just becoming tender – Set aside. 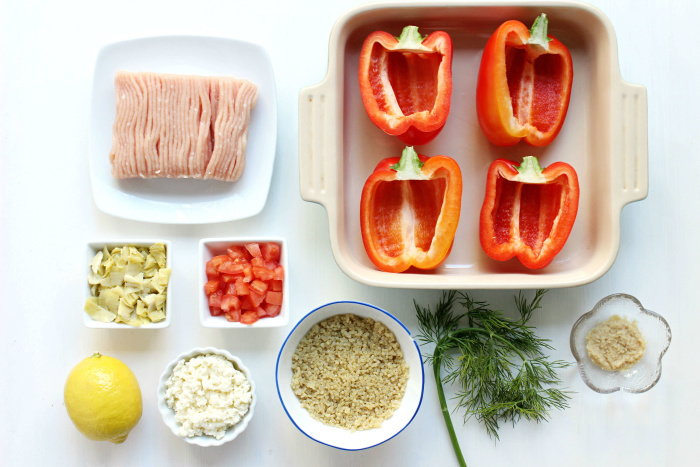 While peppers cook, in large skillet heat EVOO over medium flame before adding in ground chicken, cooking until no pink parts remain (~10 minutes). Next, stir in all other ingredients except the cheese, then reduce flame to low and cover. Allow skillet to simmer for 5 minutes. Add a shallow layer of water to baking dish with peppers. Spoon filling into each tenderized pepper, then top with mozzarella cheese. 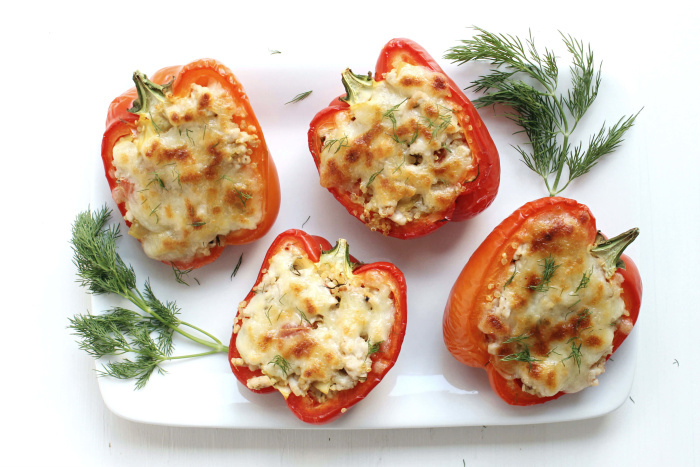 Return to oven for another 20 minutes until cheese has melted and peppers are bubbling – Immediately plate and serve, topping with additional dill and pairing with tzatziki if desired. 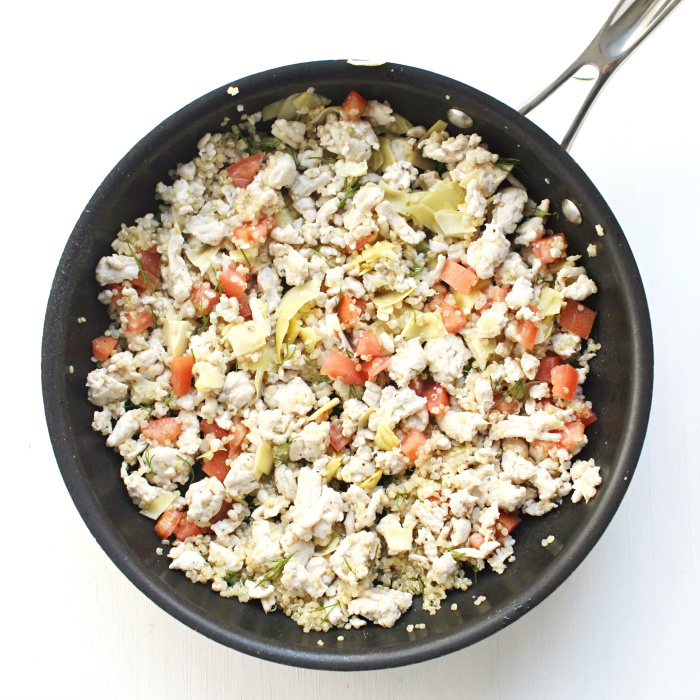 * 1/4 cup dry quinoa + 1/2 cup water and/or chicken broth will yield the 1/2 cup cooked quinoa you need for this recipe – prepare as directed on quinoa instructions. 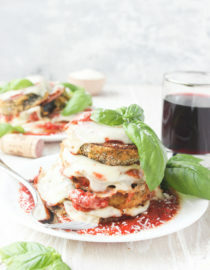 What a delicious idea/recipe Christine ! 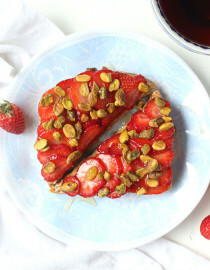 No more cookingwithcakes.com ? I’d love to try this but there is no Pin button! Oh YUM! I can’t wait to try these, this is exactly what we need around here! Stuffing a few peppers has become one of my “go tos” for a quick dinner, especially when we buy the big bag from Costco! I’ve gone the Mexican route and the Italian route, but I haven’t tried incorporating Greek flavors. What a great twist. Have you added in some feta before? yes Feta works great here! mix it up with whatever cheeses you like / have on hand. What I love about peppers is the fact that it is so so adaptable. Plus, they have this sweetness that is irresistible and goes well with almost all kinds of flavors! I LOVE what you’ve done with these peppers! That Greek style filling is just divine! What would you pair with these? I made this tonight after a weekend of eating nothing but junk. So good and good for you. Just what the doctor ordered. We will definitely be making it again. Hi there! If I don’t want to use tomatoes what would be a good substitute? Quinoa isn’t particularly low carb, nor is rice…can you perhaps suggest something else to substitute? I have these on the oven…my partner seems excited. Fingers crossed. I made these tonight with half quinoa and rice. 2tbsp of Romano cheese gives the mozzarella a nice zip. They were well received.